Pope Innocent III sent Peter Parenzo to Orvieto as legate in 1199. A group of heretics murdered him, and he immediately became the centre of an important cult. He was buried in Santa Maria Prisca and some of his blood was inserted into a cavity that was made in the heart of the infant Jesus in a panel of the Madonna and Child (now lost). A plaque on the exterior side wall of Sant' Andrea claims that Pope Honorius III “canonised” Peter Parenzo in the church. In fact, he was never canonised: Innocent III explicitly refused to do so, and Honorius III probably did no more than approve the local cult. However, the cult was immediately established in Orvieto: for example, when Chiusi submitted to Orvieto in 1200, it promised to provide (inter alia) a candle for the feast day of “the blessed martyr, Peter Parenzo”. The relics must have been moved to the Duomo in ca. 1297, when the older cathedral was demolished. They were moved to the Cappella del Corporale there in 1335. At a later date (probably towards the end of the 14th century), the relics and those of St Faustinus were moved to a site to the left of the high altar. ✴payments for lamps and candles for the chapel continued into 1369. This fresco, which depicted the two saints flanking an image of the Pietà, was covered by a wall in 1502-3, but recovered and detached during the restoration of the chapel in 1996. It is now in the Museo dell' Opera del Duomo. The contract between the Opera del Duomo and Luca Signorelli of 1500 included the redecoration of the Cappellina dei Corpi Santi. 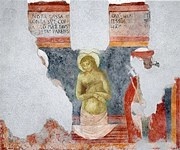 Payment for the building of a wall in front of the existing fresco (above) is recorded in 1502-3. 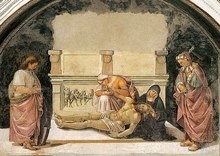 The new fresco, which was executed on this wall, depicts the Virgin's lamentation over the Dead Christ with St Mary Magdalen, St Faustinus and St Peter Parenzo. The scene is set in front of a sarcophagus that contains a fictive relief of the Deposition of Christ. Scenes of the martyrdoms of SS Faustinus and Peter Parenzo are depicted in tondi in the shallow sidewalls of the chapel. Return to Saints of Orvieto.